I'am a SAHM of three , a daughter and two son's, I'am married to Jim and we are in the process of building a brand new log home. Happy Friday to all !! Good Afternoon to all ! My baby Dane is 6 months now !! 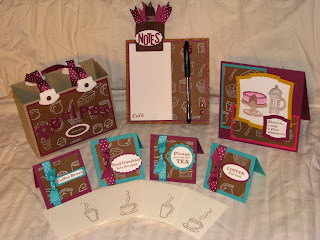 Here is a set a came up with for the CHF week #5 one sheet wonder design challenge, it contains a recipe box, 4- 3x3 mini cards with envelopes, a large card and a fridge note pad.